We stay at Apollo Bay Echo YHA. You are welcome to upgrade to the following at a extra cost of $88 per room. Private Family room (sleeps 4, double bed and 1 set of bunk beds) This would be suitable for triple share. All rooms have shared bathrooms, toilet and kitchen and lounge area. If fully booked we make use of other backpackers in Apollo Bay. Otway Fly Treetop Adventures offers a whole host of experiences with the two core activities being The Treetop Walk and The Zipline Tour. The Treetop Walk is a 1 hour rainforest walk experience that is approx 2km in total and features a 600mt long and 30mt high steel structured treetop canopy walkway that takes you right into the treetops. It’s the longest and tallest walkway of its type in the world and includes a thrilling cantilever. The Zipline Eco-Tour is a 2.5 hour, fully guided experience and including training and simulation, 8 cloud stations, 6 flights and 2 suspension bridges. The ticket price also includes the world famous Treetop Walk. 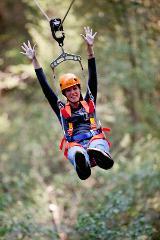 This Zipline Tour is the only Zipline Tour for Victoria! Stop at Lavers Hill for lunch (own cost), Enjoy the gardens and parrots while eating. We leave Melbourne at 4.45am and head directly for Mansfield. We reach Mansfield at approx 7.30 am. Finally around 8.15 am we head up to the mountain to reach the main car park by 9 am. Once on the mountain the day is all yours to experience the wonderful views, explore the mountain and ski or snowboard the slopes. A free shuttle bus operates from the car par to the village and smaller shuttle busses operate within the village. There are numerous shop and restaurant within the village. For those that need lessons there are various ski lessons that operate during the day. We then return directly back to Melbourne. Here you will have the afternoon to enjoy yourself with up to 200 species of Australian birds, mammals and reptiles. There are various presentations including the Bird of Prey flight for you to enjoy. There are picnic facilities or bistro for lunch (own expense). Do you need a bus? Office Functions, Corporate Function, Transfers, Private Charter, Golf Days, Day at the races, sporting events or any other adventure that you might have. Email us for a competitive quote. Heading east out of Melbourne our first stop will be Grant’s Picnic. Our first activity is a short walk through the forest. Then enjoy a Devonshire tea (scones with tea or coffee) while you take in the splendours of our natural wonderland. After breakfast take the opportunity to hand feed a variety of parrots. We then take a slow drive through the remainder of the forest stopping to visit some of the quaint villages. We drive east of Melbourne directly to Yarra Valley Yarra Valley is regarded as one of Victoria ‘s best wine regions. Our first stop is Domaine Chandon where you will join go on a self guided tour showing the process of making sparkling wine. Light lunches (own expense) are available after the tour. The region has a rich history of viticulture and wine making that goes back 150 years, but it has only been in the past 15 years that it has once again come to the forefront as a significant wine and tourism destination. We then visit another 2 – 3 vineyards in the region depending on the time. After an enjoyable afternoon of wine tasting we return to Melbourne. After collecting you from your hotel we take a slow driver through the city downtown area. We point out some of our famous landmarks and buildings. Then we head back to the city. These tours can be personalised to suite the group’s needs. Our first stop is the wildlife park where you can see crocodiles, snakes, and hand feed kangaroos and many other Australian animals. We then drive to Sovereign Hill where you’ll spend the afternoon experiencing and learning about the history of the gold rush in the 1850’s. Try your luck at panning for Gold. 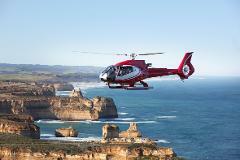 We head south of Melbourne directly to Phillip Island. After our 2 hour journey, the first stop is the wildlife park (included) where you will have the opportunity to feed the kangaroos and view many of the other Australian animals including koalas. We then visit Cowes the local village on the island. Here you will be able to explore some of the local shops, purchase some refreshments (own cost) and enjoy a stroll on the local beach. We then travel to the Nobbies, a rugged rocky outcrop and seal rock. Here you will get the chance to walk along the board walk and visit the seal centre. Finally we head to the penguin parade to watch the penguins returning to their nests from a day at sea. After the penguins we head directly back to Melbourne. Our first stop is Bendigo where you will embark on a 1 hour underground gold mine tour. After a coffee break (own expense) you will board a talking tram for a tour on the history of Bendigo. The Tram will also stop to allow you to explore the old tram yards where various trams are on display. We then continue north to Echuca arriving just in time for lunch (own expense). You will have chance to explorer the Historical village. Here you will experience a fantastic cruise onboard a historic paddle steamer along the mighty Murray River (included). Once we reach the Grampians we head straight up the mountain. We travel through the Grampians stopping at points of interest such as The Balconies and McKenzie Falls (400 steps to the bottom) and Boroka lookout. We also visit some of the water reservoirs in the area. 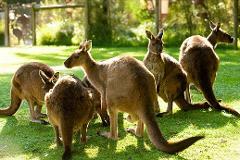 The Grampians has a vast number of wild life including kangaroos and wallabies are often spotted in the wild. Many varieties of bird life including cockatoos frequent Halls Gap and surrounding area. We then travel into Halls Gap for a break to enjoy lunch (own expense). After lunch we visit the Aboriginal Culture Centre, to learn about their history and culture. We travel west out of Melbourne to Mt Macedon. We head up to the top of the mountain to enjoy some great views. On our way down we stop at the famous hanging rock picnic ground. If you are energetic you can go for a climb up to the top of hanging rock. In the afternoon we go to Hepburn to visit the Lavandula, the Swiss Italian Farm. We journey south of Melbourne to St Kilda hugging the bay all the way to Mornington. Our first stop is Mornington Pier where we’ll break for morning tea (own expense). Stopping at some glorious beaches along the way to take in the amazing views and have close look at the famous bathing huts. We then turn inland to Arthur’s Seat, here you will enjoy the magnificent views of the bay. For those that want the best view of the bay, can board a state-of-the-art gondola at the Arthurs Seat Eagle and fly over the state forest. (own cost). We will collect you at the bottom of the mountain. We then travel onto Sorrento for lunch (own expense) and explore some of the local retails store. Once over the bay we take a slow drive around Queenscliff. Finally we visit the Point Lonsdale Lighthouse, which is at the entry of Port Phillip Bay. We then take a drive through Geelong’s magnificent waterfront. Finally we return directly back to Melbourne on the freeway, entering Melbourne via the Westgate bridge. Then we then turn inland to Arthur’s Seat. Here you will enjoy the magnificent views of the bay. Finally we board your fishing vessel for an afternoon of interesting fishing on the magnificent Port Phillip Bay. General/Mixed Bag Fishing – Port Phillip Bay is predominantly Flathead, but in season, there are always other fish around i.e. Snapper, various Sharks, Garfish, Rock Cod, Whiting, and Leatherjackets. We travel west out of Melbourne to direct to Torquay, the surf capital of Victoria. First stop is the foreshore of Torquay for morning tea. Then it onto Angelsea for your 2 Hour surf lesson. After lunch it back to the water, to practice what you have learnt in the morning. 3 pm we head back to Torquay.